Troop 89 is chartered by the Boy Scouts of America to the Lord of Life Lutheran Church in The Woodlands, Texas. 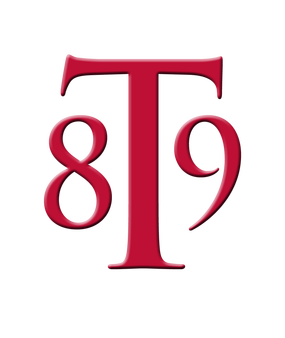 The troop was first formed in 1988 by John and Sandy Sanders and Frank Fournier. Today Troop 89 has grown to 40+ active Scouts and has trained and graduated more than 70 Eagle Scouts. Troop 89 is well financed and operates at the Gold Level of BSA'a Journey to Excellence standard. It also maintain complete set of up-to-date scouting equipment including a new troop trailer. Troop 89 is a boy led troop that teaches and operates by the BSA Patrol Method. The troop has several age-based patrols that range in size from 4 up to 10-12 scouts. We camp every month except August with June and July reserved for Summer Camp and High Adventure camping. The troop is led by the Senior Patrol Leader who is led by the Scoutmaster. The Senior Patrol Leader leads all weekly meetings, camp outs and other activities. He relies on the Assistant Senior Patrol Leader, Patrol Leaders, Quartermaster and other scouts in leadership positions (collectively called the Patrol Leader Council) to help plan activities and operate the troop. Supporting the scouts and the Scoutmaster is the Troop Committee led by the Committee Chairman. The Troop Committee operates largely behind the scenes managing the operations of the troop and ensuring that activities are well planned. 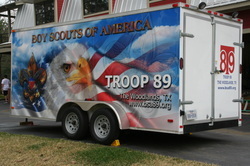 They also manage the troop trailer, gear, gear storage, fund raising, advancement, finances, service projects and more. The Committee is comprised of many troop parents including the Scoutmaster and Assistant Scoutmasters. The Committee meets once a month, on the 3rd Tuesday of the month, to plan and discuss all troop business. Troop 89 emphasizes advancement. All scouts are guided through their Path to Eagle Scout by a Patrol Advisor. Scouts are taught core scout skills while working toward their First Class rank. All scouts also have many opportunities to earn Merit Badges - at summer camp, winter camp, during weekly scout meetings, at nearby museums and on their own working with a counselor. Troop 89 emphasizes mastery of scout skills and essential merit badge content. We don't rush scouts to their Eagle Scout Award. Scouts are awarded newly earned rank awards and merit badges during Courts of Honor held three times per year. All scouts are encouraged to participate in Troop 89 service projects. Some service projects are arranged by the troop. Others are arranged by scouts themselves often to support reaching Eagle Scout. Troop 89 plans and participates in several service projects each year. The cost to operate Troop 89 is covered by very modest quarterly dues. Campouts, summer camp and other activities have additional costs covered by those who attend. Troop 89 provides several fund raising opportunities throughout the year so scouts can earn money to cover some or all of their expenses. Each scout has a scout account managed by the troop Treasurer so all expenses can be tracked individually based on the activities of the scout. Troop 89 is a thriving, active, fun group of scouts, scouters and other parents. Please contact us if you are interested or need more information.